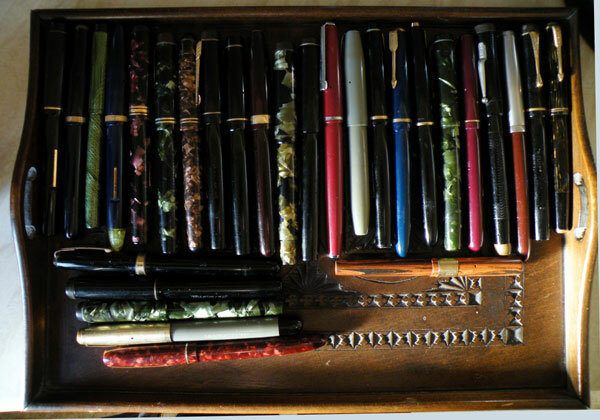 This lot arrived this morning: 28 pens in need of restoration. So you know what I’ll be doing for the next few days. If I were the webmaster of a certain fountain pen group which shall remain nameless (but whose initials are FPB) I would make it a competition to Name Those Pens and then drag it out for about a week. However, as I find that sort of thing thoroughly tedious and I expect you do too, I won’t bother. That picture’s probably too small anyway. So I’ll tell you that there’s a Swan there and a Blackbird too. There are several Mentmores of various dates and some Parkers including a Vac and a 51 Vac, along with a brace of Stephenses, a Relief and a wee Waterman chatelaine. And a few other things including a green herringbone Valentine. Doubtless some of them will be featured here soon. Oh, and the tray’s an example of Scottish early twentieth century chip carving, if anyone noticed it.